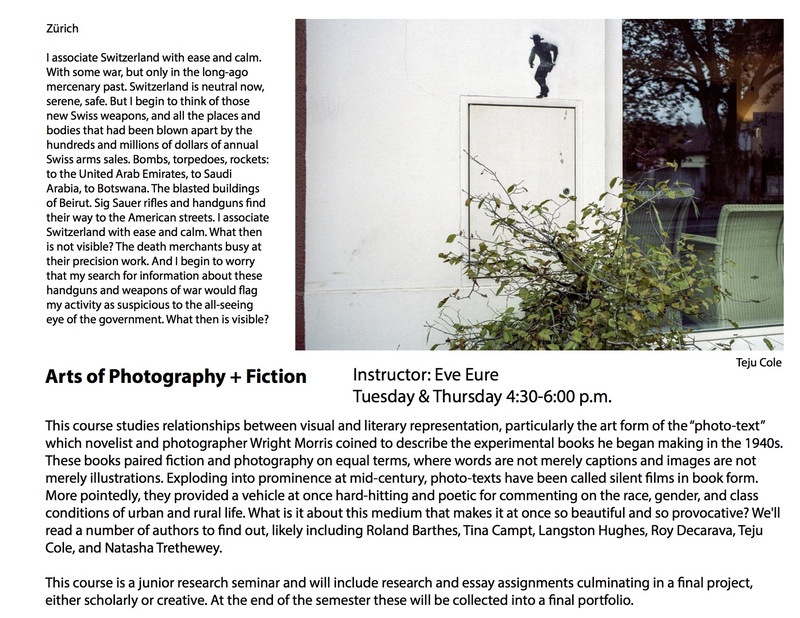 This course studies relationships between visual and literary representation, particularly the art form of the “photo-text” which novelist and photographer Wright Morris coined to describe the experimental books he began making in the 1940s. These books paired fiction and photography on equal terms, where words are not merely captions and images are not merely illustrations. Exploding into prominence at mid-century, photo-texts have been called silent films in book form. More pointedly, they provided a vehicle at once hard-hitting and poetic for commenting on the race, gender, and class conditions of urban and rural life. What is it about this medium that makes it at once so beautiful and so provocative? We'll read a number of authors to find out, likely including Roland Barthes, Tina Campt, Langston Hughes, Roy Decarava, Teju Cole, and Natasha Trethewey. This course is a junior research seminar and will include research and essay assignments culminating in a final project, either scholarly or creative. At the end of the semester these will be collected into a final portfolio.